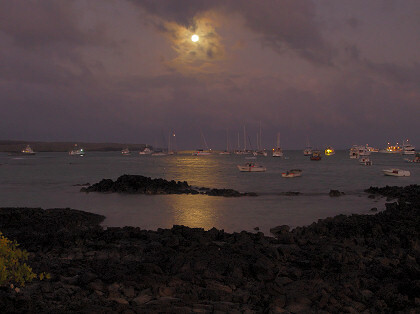 The moon rising over the anchorage at Academy Bay, taken the day after the previous moonrise picture. I was hoping to get a picture of the moon rising out of the ocean, but clouds interfered. 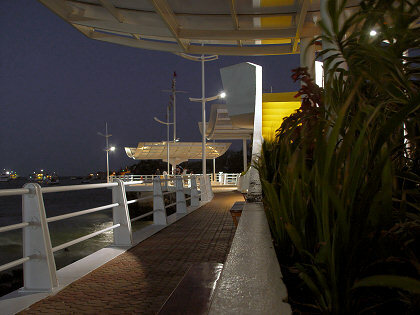 A night view of the tourist pier. I took all the night pictures using my miniature backpacker's tripod. It's very small and only holds the camera a few inches above the ground, but it has a ball-and-socket head so you can aim the camera as you wish. For this picture the tripod was resting on the wall next to the plants. Things got off to a pretty slow start today and there was no rush or any great interest in going ashore. 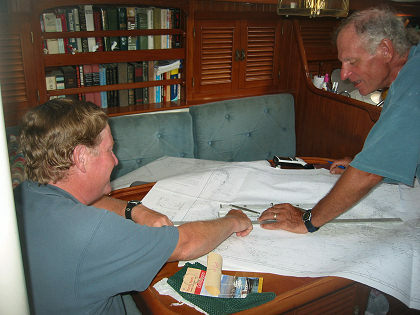 Marcie and David spent a few hours going over charts to plot the passage to Isla Isabela, our next stop in the Galápagos. By the most direct route it's only a short hop, but they decided to make a little detour north to the equator so I could experience an equator crossing on Nine of Cups. Crossing the equator at sea is a notable event in a cruising voyage—Marcie and David had crossed on the way south from Panama to Ecuador and they had highlighted the event on their web site. After they finished plotting waypoints and programming the GPS, they took out the charts for Easter Island and we all worked out the navigation. It would be a long enough voyage that a "great circle" route would be desirable. A great circle route is the shortest distance between two points on a sphere (like the earth). You can approximate a great circle route by tautly stretching a string between two points on a globe (although we didn't have a globe). Normally, we would navigate using the GPS, but there was some question whether the GPS automatically followed a great circle route. Being a couple of engineers, David and I spent quite a while calculating, plotting, figuring out how to use a great circle chart, and making test cases to check our theories before we finally concluded that the GPS did, in fact, follow a great circle route. Of course the Garmin GPS manual could have made it a lot easier by mentioning this fact but it was mum on the subject. So our big trip to Easter Island will basically require only one GPS waypoint, albeit a couple thousand miles away. Afterwards, David worked on some boat chores, like gluing down the sink bowl in the forward head and polishing the fuel in the second fuel tank. As before, it was a messy job and most of the floorboards were torn up. David found quite a bit of water in the fuel tank plus some gooey gunk. He thought that perhaps the fuel hadn't been properly filtered by the marina when they repaired the fuel tanks back on the mainland. I went on a "scavenger hunt" around the boat looking for some misplaced equipment. Without too much trouble I found the portable anchor light, surprisingly enough right where it was supposed to be. I also found the missing Brion Toss fid (a rope-splicing tool) after being given a hint as to where it was last seen. I should have been working on the big email I've been putting together, but after having neglected it for days I don't even remember where I was. 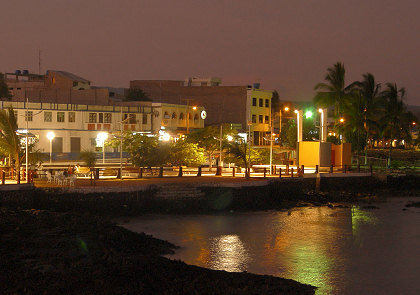 In late afternoon, I water-taxied ashore to go for a walk and explore a pedestrian walkway around a small lagoon just inland from the harbor. I found the access path to the lagoon but it turned out to be a local swimming hole surrounded by mangrove swamps. There was no walkway at all, unless at low tide you can walk on the rocks. I had probably misinterpreted the green line on the map—the legend indicated "pedestrian walkway" but it could also mean "park boundary". After getting a few good moonrise pictures yesterday, I was hoping to get more moonrise pictures tonight. A good time to take moon pictures is when the full moon is just above the horizon but there's still some lingering daylight after sunset, and tonight should be a good night. Unfortunately there were lots of clouds and I had to wait quite a while beyond moonrise to get a picture. By then daylight was long gone so everything else was quite dark and the resulting pictures were disappointing. In darkness I water-taxied back to the boat and we had dinner of spaghetti and meatballs.